Livingtree is your community’s own private network. As a parent, you’ll see posts (messages, photos, videos, and files) and events from your child(ren)’s teachers and school administrators. Watch for your ‘Welcome to Livingtree’ email which will provide your username and password. Think of Conversations as your “homepage”. You can scroll through your stream to see posts that have been shared with you by your child’s teachers, school administrators, and other parents. You will see your children and the classes they’re connected to in your left navigation pane. Click on a class or a child to view content that’s been shared with a specific class. Group Code is one way to connect to a class. If you’ve been given a group code printout, you can enter it here. Click on any top navigation application (Calendar, Give, My Network, Inbox, Directory) to explore the functionality. Skip ahead to read a brief description of each one. Use these shortcuts to access your account settings – ‘Edit Profile & Preferences’, ‘My Network’ (to edit your groups & connections), and entering a group code, if applicable. Use ‘Edit Profile & Preferences’ to update information such as email address, phone number, and notification preferences. To see posts translated to one of 100+ languages, select your preferred language. See a quick view of any events coming up within the next two days. Click on ‘Calendar’ to see a day, week, or month view of your Livingtree events. Your calendar will populate with events as they are shared with the school or classes. Filter your Conversations feed by selecting Pinned, Files, Photos, Events, or search by user. Search all Conversations content (including comments) by entering a key word in the search tool. View events that have been shared with you and create and share events with classes, or your own private family group. Events can include reminders, volunteer tasks, RSVPs, notifications, and more. You may add your Livingtree calendar to an external calendar by clicking on the subscribe option in the top right corner when viewing the calendar. Invite other parents/caregivers to your family group so that they will receive the same content through the class and school, rename your family, remove a connection to a class, and more. 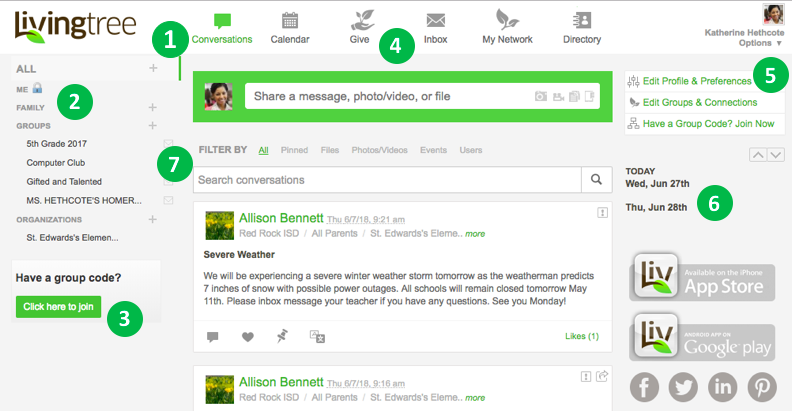 Inbox is perfect for reaching out privately to any teacher, staff member, or parent at the school. No need for email addresses – just type your recipient’s name in the ‘To’ field. They will receive your direct message in their Livingtree account and be notified of your message via email/mobile. Access a complete list of the people connected to your Livingtree groups. Click on a class or school to see the contacts in each group. You can click on a contact’s name to view his/her profile, or to send a direct message. (This is an optional feature). Donate to a school campaign. Enter in your donation amount and credit card information to contribute. One of the easiest ways to use Livingtree is to download the free mobile app for either iPhone or Android devices. You can do almost everything you can do on the web right from your phone. Just go to the app store on your phone and search for Livingtree (one word). If you have any questions or need further assistance, please, contact Livingtree at support@livingtree.com.